The new low cost Garner HD-2E Data Eliminator™ Degaussers are the perfect Commercial/Government Magnetic Media permanent erasers that use APT, Advanced Pulse Technology, that generates a quick and totally effective burst of energy to totally erase most Media formats. The Pulse uses up to 90% less energy compared to similar models, whilst producing an erasing field several times stronger than is required to guarantee that all Data is completely unrecoverable by computer or laboratory attacks. The advanced technology does not rely on software and will therefore completely and permanently erase failed and damaged hard drives irrespective of the operating system or interface. 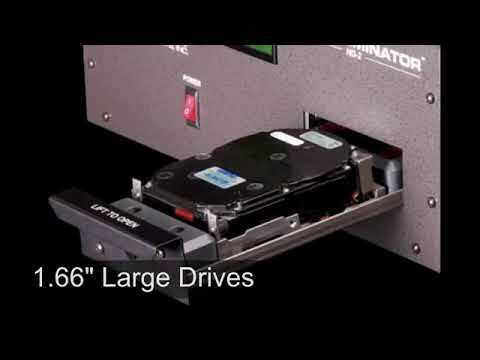 The HD-2E is the newest and most innovative product in the Garner line of Degaussers capable of erasing Hard Drives including Laptop, Desktop and Network up to 1.5" high plus High Coercivity Back up, and Video Tape Media, including all formats of LTO 1,2,3,4 ; SuperDLT I & II, DLT, AIT, 8mm and more, all without requiring the use of any adapters. Features include a continuous duty rating with no cooling necessary, a quiet operation and a 60 second cycle time - simply place your media into the open drawer and push the "Erase" button and within 60 seconds your media is totally erased. The HD-2E has been independently tested and certified to meet both ANSI and CE standards. Built-in safeguards check the stored power before each erase cycle ensuring complete erasure every time. A field strength meter, audible tones and lighted push buttons report the status of the degausser to the operator. For extra safety the HD-2E is completely shielded so no magnetic fields are emitted from the surrounding area of the unit safeguarding any vulnerable items, and can be supplied with an optional Military Specification Shipping Case.